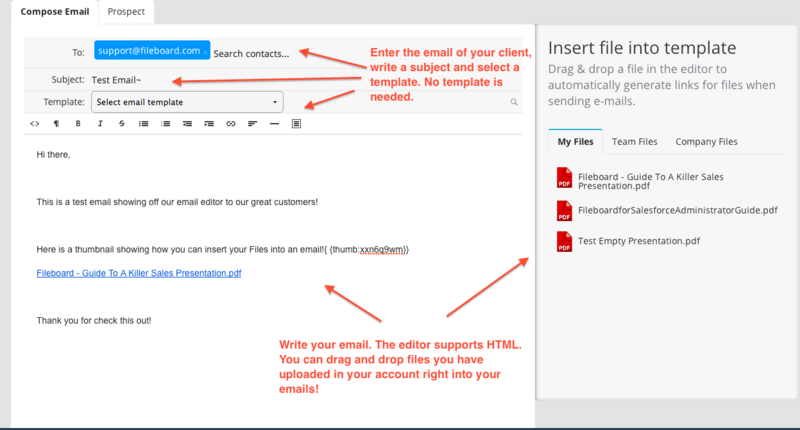 Fileboard allows you to create and send emails to your clients. This guide will help walk you through creating your own emails and sending them to your clients. Enter the email of the recipient. Enter the subject of your email. Select a template(optional). The email editor supports HTML. Create an engaging message to your clients. You can also include thumbnails to files you have uploaded to Fileboard by clicking and dragging them into your email. Click on the Save as Template button to save your email as a template. A blue bell indicates that you will receive a notification when this email is opened. A grey bell represents not wanting to receive notifications. Click Send Email when you are happy with your email.